For an exercise that's all about family, researching your genealogy can be an oddly lonesome affair, filled with long hours spent sifting through records and making awkward phone calls to far-flung relatives. But Geni turns tree-building into a collaborative effort: the free site gives you the basic tools for diagramming your ancestry, and it also lets you invite others to contribute. 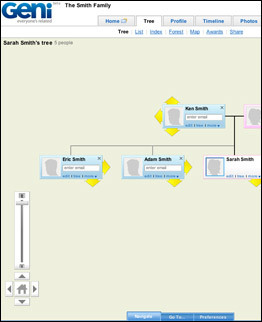 If you're serious about tracing your lineage, you'll probably still click on stalwarts like Ancestry.com, Family Search and the USGenWeb Project for their vast digital archives, but Geni makes it easier  and more fun  than ever to create and share your family tree.